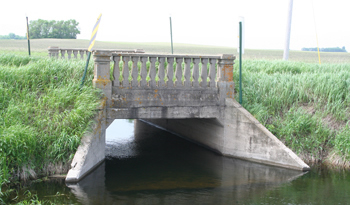 Bridge L7898 is a single-cell, cast-in-place concrete box culvert carrying two lanes of traffic on Township Road 27 over a branch of Spring Creek. Bridge L7898 is located in Normania Township in rural Yellow Medicine County. The structure has Classical Revival-inspired, open-balustrade, concrete railings on each side of the roadway. The bridge was designed by the Yellow Medicine County Highway Department and constructed c.1925. It is significant for its ornamental railing, which is rarely found on remote, rural crossings and typically reserved for larger, urban bridges. Bridge L7898 is located about one-quarter-mile to the east of an identical structure, Bridge L7897, built on the same road in the same year. Ornamental railing with Classical Revival-inspired endposts and balusters.